Themes are the design of your whole WordPress website, It starts with colours and every single element which give look to your website are in theme. Themes give a look to your website and it helps your visitor to identify your website. And it is very important to stay with a look or design for a long time. If you are changing the theme after few days or after every single week then it can create a bad users experience, I am not saying that you should not change your theme but think when you really need to change it. When an idea comes to your mind that you should change the theme you are currently using then must find the reasons, why you want to? StayMeOnline was using a free theme called Schema Lite before but then I think to make over my blog with a premium theme. I chose GeneratePress Premium WordPress theme because it has an awesome design, Easy to use for the beginners and also affordable as well. GeneratePress is a fast, lightweight WordPress theme. It is one of the best customizable WordPress themes available today. The theme is totally secure and SEO friendly as well, There are many features available in GP premium you can activate which you want to use in customization. I also recommend you to purchase the same if you are thinking to purchase a Premium theme. How To Purchase GeneratePress Theme? Purchasing GP theme is not a tough work, it is easier than shopping online. Here is the step by step guide for you to purchase the GeneratePress theme. Before making your final decision I must suggest you take GeneratePress WordPress Theme Demo by clicking here. If you make your mind to purchase the GP Premium then Click on this link. After clicking that you will be redirected to the homepage of GeneratePress, Scroll down to the part you can see in the below image. And then click on the Add to Cart button. You will be able to see that the theme is added to your card like shown in the image below. Choose the appropriate payment methods for making the payment, there are only two methods. First is Paypal and another one is the Credit card. Now, Create a new account if you don’t have one. If you have created an account already in GP then you can log in by clicking the Log in link. Fill some basic details to create your account like your Email address, First Name, Username and Choose a password. If you choose Credit Card as your payment methods then you will have to fill some more fields where you have to enter your credit card details like Card Number, Expiry date and CVV. I am sure you know how to make payment by credit card. Apart from the Credit Card details, you have to enter billing details like your city, country, zip code and few more. Click on the Purchase Button And you are done with this. You will get some emails from the GP about the Payment, Receipt and most important License Key. This is all you need to do to purchase the GeneratePress Premium theme. Let’s move to the Installation section. How To Install GeneratePress Theme? I have explained already that how you can purchase the GP Premium theme and I’m sure you understood. After purchasing the theme you are wondering how to install that on your WordPress site. Must Know: The GeneratePress Premium is not a theme rather it is a plugin which enhances the customization level. It adds a lot of premium features when you install it with GP theme. First, you should have the GP Free theme then you should install GeneratePress Free theme first. For installing the GP Free theme, Just go to your WordPress Dashboard and then Appearance>Theme>Add New. Search GeneratePress in the search box then Click on the Install and Activate button. As shown in the below image. You can also upload the theme’s file by clicking the Upload Theme button But before Download the Theme here. After installing and activating the theme, You have almost done just need to install and activate the plugin. You will get the link to the GP premium theme in the email you got from the GP or you can also login to your GP account to download the Plugin. 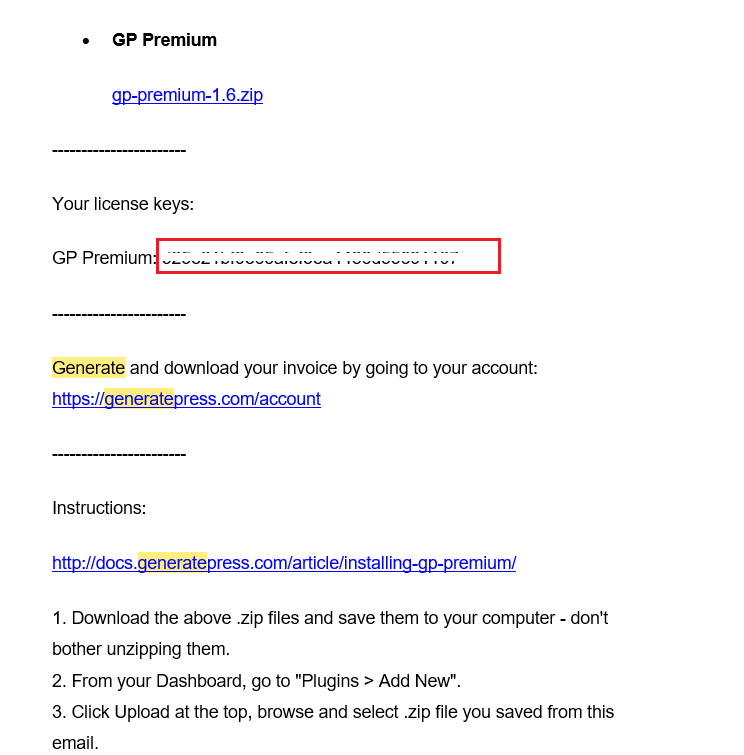 So, First download the GP Premium plugin from the given link on the email or from your GeneratePress Account. After installing the GP Premium, Click on the Configure link like shown in the image. On the next screen, you can see an Updates box on the right top corner which is asking to enter your license key. You can find the key in the email you got from GP or by logging into your GP account. Open the email you got from the GeneratePress and copy the license key and paste that in the updates box. Then paste it into the box which you can see on the right top corner like shown in the below image. Activate the features which you need, I suggest you activate all at once by selecting all and then bulk activate. All is done, Now your GP Free theme becomes GP Premium theme. Now you can take benefits of all their premium features and customize your website more easily. I am sure you will be wondering for the Child theme of GP after installing the Theme, You can easily create a Child Theme if you know how to create one. If you don’t know then you can download the GP Child theme from here. I love GP theme when I started using it on my blog, this is awesome and has many features which customization easier if you don’t know coding. This is the best option for the beginners who want to start with a Premium theme because it is cheap. And also good for the people who want to move from free theme to premium theme. I will be discussed more pros and cons in our upcoming posts. For now, I hope you liked this post and found it helpful for you If you did then must share it with others. If you have any query then just let me know in the comments section I will be happy to answer them. You can also get in touch with me and other bloggers, WordPress users in our Forum, Click here to visit the StayMeOnline Forum.